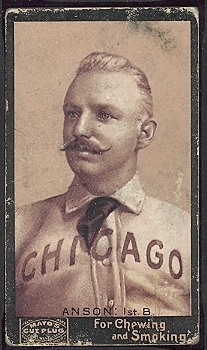 DeansCards.com has been lucky enough to see a few 1895 N300 Mayo’s Cut Plug baseball cards in recent years. They are some of the rarest Pre-War baseball cards and have a fascinating history. As early as 1894, P.H. Mayo & Brothers Tobacco Company of Richmond, Virginia began issuing a set of 40 cards that measure 1⅝” by 2⅞”. Cards #1-28 feature players in their uniforms, while cards #29-40 feature players in their street clothes. The N300 set has eight total variations, including team, position, and error/corrected cards. These blank-backed cards were inserted into the large metal lunch-pail tins that were full of tobacco. Unfortunately for collectors, the Mayo company decided to use cheap paper that has not maintained its integrity over the years. Some of the well known players included in the Mayo’s Cut Plug set are Cap Anson, Buck Ewing, Ed Delehanty, and John Ward. The P.H. Mayo & Brothers Tobacco Company also issued a boxing and football set. The football set includes only Ivy League college players. The boxing card set is distinctly different from the other two sets due to the posing of the boxers on the front. The baseball and football players are portraits, while the boxing cards show the boxers outside in traditional boxing pants. The Mayo’s Cut Plug advertisement appears in a different position than the other two sets. DeansCards.com is always looking for Mayo’s Cut Plug cards. 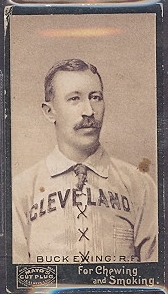 If you are interested in selling Mayo’s Cut Plug cards or any Pre-War baseball cards, please click here. If you are interested in viewing our Pre-War inventory, please click here.